All are invited to a free community celebration starting with the lighting of a living blue spruce tree as the Bell Choir of Ephesus Seventh Day Adventist Church rings in the spirit of the season. Break bread with neighbors and friends of the park inside Pelham Fritz Recreation Center, that will include latkes and other Kosher dishes in celebration of Hanukah. In anticipation of the lighting of the first Kinara candle for Kwanzaa on December 26, an African dance will be performed to represent the tradition. 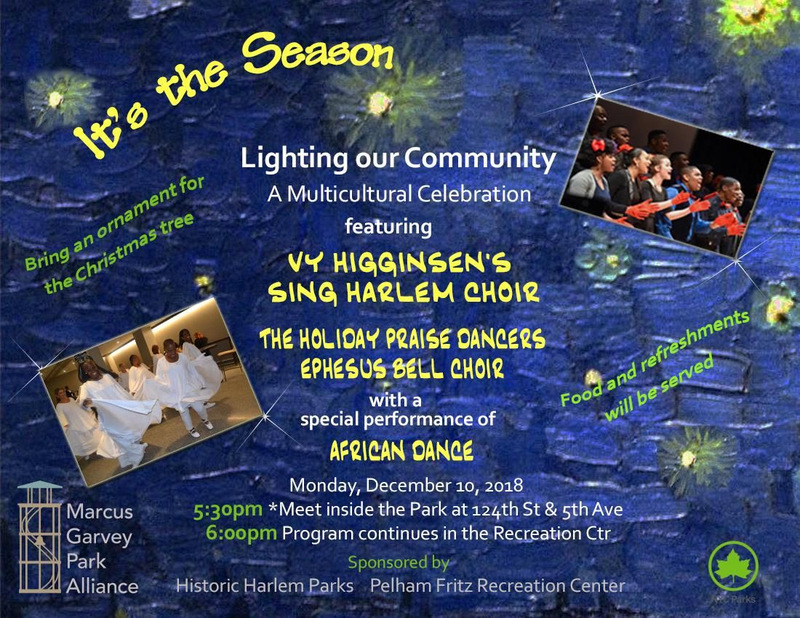 The Holiday Praise Dancers, led by recreation center co-director LaSharn Patt, will warm up the crowd for Vy Higginsen’s Sing Harlem Choir.